Pneumatic Bead Expander 24 - 34" Diameter Ken Tool T132 / BOWES KT T132. Expanders fit most bias ply passenger tires. A pliable neoprene rubber tube is encased in a tough, long-lasting nylon cover. Expanders slip easily over tire and withstand contact with oil, grease, solvents, and acids. Follow instructions included with tool. Use on bias ply, 14", 15", 70-series tires and larger. Expands bead by compressing tread. 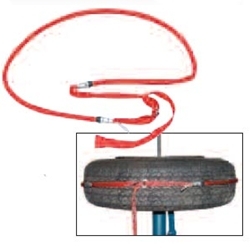 T132 for belted bias ply tires, includes over-pressure release valve. T133 for standard bias ply tires.